Do we need a “NEW Vancouver Special”? Development that houses more than two families on a lot? Infill that is attractive and more in character with local architecture? Housing that is affordable and quick to design, approve and build? And like the old Vancouver Special, can we make the new version something so tuned to market demands that it is widely adopted and becomes a part of the fabric of Vancouver’s neighbourhoods? What might surprise you is that some of these ideas already been designed and vetted by the City some time ago … but first a look back. The Vancouver Specials that proliferated from the 1960s to the early 1980s are celebrated by some in our city as an iconic form of once-affordable housing. They were favoured by new immigrants to Canada, many of whom had extended families. Simplicity and repetition were part of the reason for their success. Stock plans for small 33 ft. wide lots could be bought for as little as $65 in the 1970s, with all the info needed for a one-page planning application at City Hall (1). They were approved quickly and built almost as fast in many of Vancouver’s close-in suburbs. After falling out of favour in the 80s, Vancouver Specials are enjoying some new popularity today. Many people are updating them, finding value in their roomy volumes perhaps after beefing up insulation and replacing the single-pane aluminium frame windows. The basic template for the Special was a two storey box with a low pitched roof; living, kitchen and dining rooms on the top floor, with balconies on the front and decks on the back; and bedrooms below. It was easy to add another kitchen and convert these homes to duplex use. Builders finished the exterior with siding, brick or stone on the first floor and cheaper stucco above, a departure from the finishing of craftsman homes that were more typical of Vancouver’s older neighbourhoods. On a 33’ x 120’ lot, a builder could easily get two 1,500 sf levels for a total of 3,000 sf of gross floor area. Compared to apartments today, 1,500 sf of space for each of two families today sounds pretty spacious. Over a 3,960 sf site, 3,000 sf of development equates to a 0.76 Floor Area Ratio (FAR). Grossing up the land 30% to include road space, this type of development generates about 17 units per acre (UPA) which is 2 to 3 times the density of farther-out car dependent suburbs, but generally below the intensity of townhouses. How could we adapt the idea of the Vancouver Special? What if we changed the Old Vancouver Special to better meet for contemporary social, economic and environmental conditions? A good start would be to break the building up to create more but slightly smaller separate units to house more families per lot, perhaps making better use of land by taking advantage of the efficiencies of assembling two to three lots. We may want to build the houses just a little bit higher – a 3rd floor perhaps with a sloping roof to minimize the apparent mass of the new buildings. More people are cycling, taking transit and car sharing (saving money) so we could reduce parking requirements which frees up more land for housing people rather than housing cars. One thing to increase would be energy efficiency and environmental performance. And perhaps we could even take affordability a bit further by sharing facilities that would otherwise consume space within each of the homes (i.e. shared laundry or workshop space). What would New Vancouver Specials look like? Well, this is where we are in luck – because a few years ago Patricia St. Michel, an Urban Planner with the City of Vancouver and a colleague from my planning days there, led a team that developed a series of prototype infill plans that capture the ideas above. Working with residents in the Cedar Cottage neighbourhood, they developed “RT-10 and RT-11” Zoning and Guidelines which are worth a closer look (2). 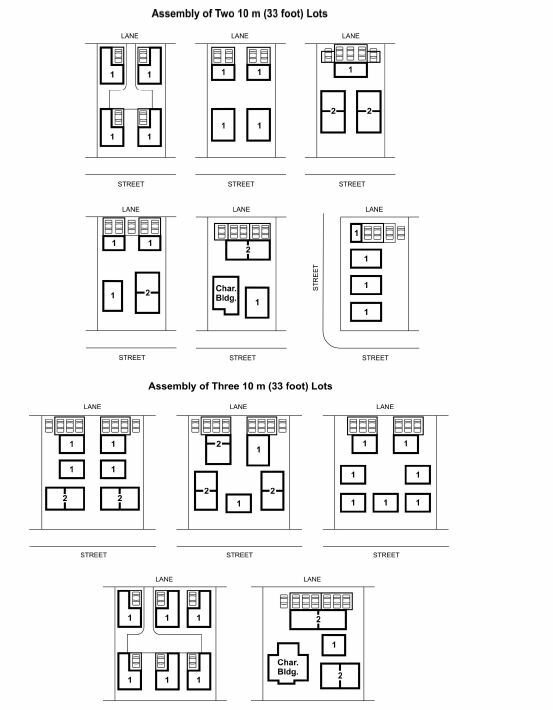 The zoning and design guidelines illustrate some prototype dwellings that can be organized on assemblies of two to three small lots. They intensify the use of land but they also respond to the rhythm and fabric of the neighbourhoods in which they sit. In some cases, setbacks are varied; in others, they remain consistent. The designs typically create multiple buildings with internal green spaces for privacy and relief. They all accommodate parking which could possibly be relaxed further in areas well served by cycle routes, transit, and car share. Where could we build New Vancouver Specials? Vancouver’s downtown peninsula comprises 5% of our land but houses 10% of our population; the predominant building forms are mid-rise and high-rise apartments, so New Vancouver Specials are not really going to work here. Outside of the downtown, the first ring of “Streetcar suburbs” from the early 1900s (i.e. Kits and Mount Pleasant) comprise 10% of land but house 15% of the population. A mix of housing, predominantly multifamily in character, defines this area. New Vancouver Specials could work here, but they are perhaps still a bit too low in density to compete with higher density options. 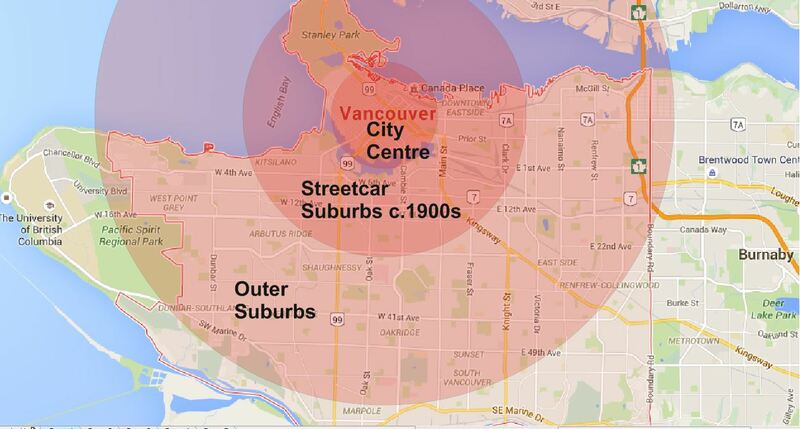 Looking further out, Vancouver’s low-density suburbs account for 85% of the land, but only 75% of our population. There may be opportunities there – ageing suburban neighbourhoods well supplied with amenities like parks and undersubscribed schools. With deference to Patricia’s superior design skills, I pulled together a quick SketchUp model of what a New Vancouver Special might look like using two 33 ft. x 120 ft. lots in an existing Vancouver neighbourhood. I picked a suburban location close to transit, parks and schools. The plan has a cluster of four 4 bedroom homes at the front of the property – each with a 500 sf floor plate and three levels, yielding 1,500 sf of space per home. Three 2-level coach houses at the back of the property yield a 1,000 sf 3 bed unit and two 500 sf one bed/studio units (two have parking below). BC’s Strata Property Act could be used to legally divide up the property into Strata Lots and Common Property. Grossing up the land 30% to include road space, this development generates about 30 UPA which is on par with ground-oriented town house development. What would New Vancouver Specials Cost? A back-of-napkin financial analysis is shown below. The cost of land is the largest factor, followed by hard construction costs, and then soft costs which include design, permits and fees, insurance and construction finance costs. A “prototype design” vetted by the City might reduce the design costs and expedite the approvals process. An unknown would be the contribution the City may seek for the additional density (the difference between the 1.0 FAR proposed from the 0.78 FAR existing). For simplicity and clarity, I’ve just looked at Land, Construction and Design Costs, factoring in a modest 15% development profit. If $500K is added to the cost of each lot – either through the land price or CAC’s or a combination of the two, the “all-in” costs increase to $695/sf, and the homes begin to look considerably less affordable. 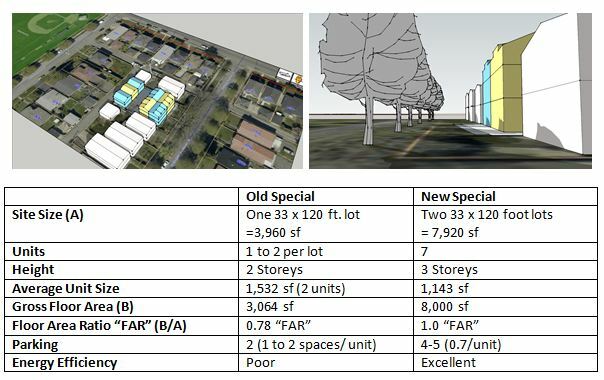 This quick design and analysis suggests that residential uses in our outer suburbs can be intensified with New Vancouver Specials but the economics are very sensitive to land prices and additional Community Amenity Contributions. With land costs at $1M per lot, the cost of new housing generated is not going to be cheap but it is going to be competitive with new mid and high rise development, the added benefit is ground access and perhaps more space for your money. Higher land costs clearly frustrate the viability of this type of development. ← Previous Post BC Property Transfer Tax “Double Dips” – time to review the tax? For those of you who are interested in the aesthetics and appearance of multi-family suburban infill, take a look at this documentary project I did in 2004 with the Vancouver City Planning Commission. In particular, this lovely infill house designed by Paul Merrick – one of Vancouver’s finest architects.